Atlanta World Premiere for "Paper Boys"
It's official. Working title, "Boys of the Wrecking Crew" has finally taken its name, "Paper Boys". The date of the world premiere will be Saturday, June 20th, 730pm in Atlanta at the beautiful Plaza Theater on Ponce De Leon and we have prepared for the possibility of adding a second showing on the same evening, but don't count on it. To view photo galleries and other info about the film, please visit the MySpace site. You should guarantee a seat early as there is limited seating . If we don't sellout, tickets will be $12 at the door. You may arrange for secure $10 payment through Paypal here. Don't forget to bring your receipt to the window at the theater. When you add tickets to your cart, the site will forward you to PayPal. If you have no account you may open one with your credit card, then proceed to your cart. What began as a response to the the real life story of the death of a young teen boy at his own hands, has become a play of redemption, salvation and a simple look at false bravado, failures to communicate, manipulation and a never-ending generation gap. My main drive in formulating the piece was the juxtaposition of comedy and tragedy, innocence and experience, the good old days versus and ever more complex society in which teens have to learn to deal with their inner conflicts. What had sat on the shelf for 15 years has finally seen society come to where it has been since its inception. Market insistence on conforming to certain filmic expectations in the early nineties stood in the way of telling a story in a honest way. I didn't want to spoon feed generic solutions or even to tell people what was a problem, but instead; I wanted to allow characters to become and feel what they chose. One has to see the film to see how it may end in a way that simply would not have been allowed in those days, especially dealing with the prospects of homosexuality, disease, and competing theories of causation versus birth of one's sexuality. I believe this film does something few films have done; it presents concerns without assuming they are problems and it allows characters to simply be instead of changing who they are. “Paper Boys” is a coming-of-age film in the strictest sense but more; it is an exploration of a microcosm of young door-to-door newspaper salesmen who are closer than most families in many regards. A truly ensemble piece, the film revolves around a common problem for teens which most often feels unique but isn’t, dysfunctional, non-traditional family. Add to this violence, psychological abuse, confusion over sexuality and a fierce awareness of one’s own economic standing, the main character turns to drugs and finds himself in a tailspin while his friends have no idea how to handle it. False bravado and hyper-sexuality amplified by drugs and painful circumstances, gives us a recipe for a rich juxtaposition of comedy and potential tragedy. The soundtrack creates a relentless ride which leaves one emotionally exhausted from laughter and tears. Best friends Sean and Steve are members of a door-to-door newspaper sales crew. They and several other friends share a world most have never experienced, joined at the hip nightly as they cruise suburban neighborhoods with their mentor, Ray, who finds them more family than employees. 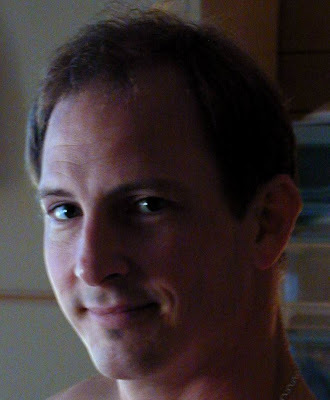 Sean discovers his life has presented him with more stumbling blocks than most face. Will he handle them well? Actors Louis Lavdas and David Hall (Sean and Steve) are blood-sworn best friends for life, one a product of wealth the other from a highly dysfunctional family; but they grew up next door to each other. Sean lived in the dump Steve's father had grown up in... next door to the new mansion. 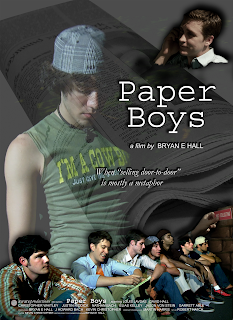 Keep Up With "Paper Boys" the Movie! Aware Productions is proud to announce the official kickoff of the choice of title for the project formerly known as "Boys of the Wrecking Crew" (working title). Paper Boys has come to the closing days of post-production and the producers are currently planning the best approach to a premier. Meanwhile, keep checking here or at the main site of Aware Productions for all news about the project and its progress. No, it's not a film about the little boys on bikes that deliver your paper; instead, door-to-door teen salesmen, Sean and Steve are blood-sworn best friends for life, one a product of wealth the other from a highly dysfunctional family; but they grew up next door to each other. Sean lived in the dump Steve's father had grown up in... next door to the new mansion.Paper Boys is a coming-of-age film in the strictest sense but more; it is an exploration of a microcosm of young door-to-door newspaper salesmen who are closer than most families in many regards. A truly ensemble piece, the film revolves around a common problem for teens which most often feels unique but isn’t, dysfunctional, non-traditional family. Add to this violence, psychological abuse, confusion over sexuality and a fierce awareness of one’s own economic standing, the main character turns to drugs and finds himself in a tailspin while his friends have no idea how to handle it. Sean and Steve are two of eight members of a door-to-door newspaper sales crew. They share a world most have never experienced, joined at the hip nightly as they cruise suburban neighborhoods with their mentor, Ray, who finds them more family than employees. The film considers sales as a metaphor for life and they all discover that each of us meets a different set of objections to the sale. One of the more experienced boys shares, "Life is just sales, man... a series of controlled failures leading to a few successes." What began as a response to the death of a young teen boy at his own hands, has become a play of redemption, salvation and a simple look at false bravado, failures to communicate, manipulation and a never-ending generation gap. My main drive in formulating the piece was the juxtaposition of comedy and tragedy, innocence and experience, the good old days versus an ever more complex society in which teens have to learn to deal with their inner conflicts. What had sat on the shelf for 15 years has finally seen society come to where it has been since its inception. Market insistence on conforming to certain filmic expectations in the early nineties stood in the way of telling a story in a honest way.